Today I did the tourist thing and went into Lima Centro to check it out. 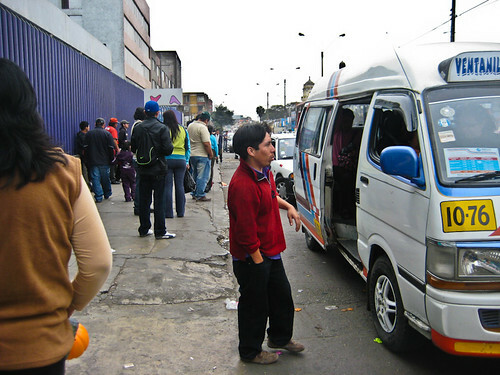 I was going to do one of those city tours on the top of the bus but they were too ezpensive – 50 Soles, what a rip-off! After having a shower and forgetting to take my towel, I hopped on the Metropolitano to the Central Station. I had no idea where I was going, I just got off the bus and started walking down the street. I saw this big building and there were lots of markets inside, so I went in. It turned out to be the central markets, as far as I could tell. 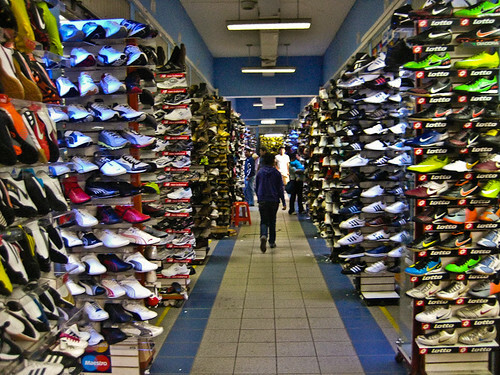 There were rows and rows of little shops selling clothes, electronics, DVD’s and shoes. I never saw so many shoes before. I was not really interested, but if you had a shoe fetish you would be in heaven, or hell. I walked around and checked everything out but did not buy anything. I went upstairs to the cafeteria area and had cerviche and pescado frito(fried fish). I really love Cerviche and its everywhere in Peru. I do not know what I am going to do when I leave Peru and there is no more Cerviche. Maybe I will have to get a recipe and make it for myself. Someone here should know how to do it. After the markets, I walked down the road and checked out the traffic on the streets. It really is chaotic. There are buses and taxis and cars going all over the place, without any seeming organisation. This collectivo stopped near where I was and the conductor just starts yelling out the destination and drumming up business. There was not much to do around where I was. I could not find any tourist information, so I trudged back to the Metropolitano terminal and jumped on the bus back to Barranco, where I am staying. 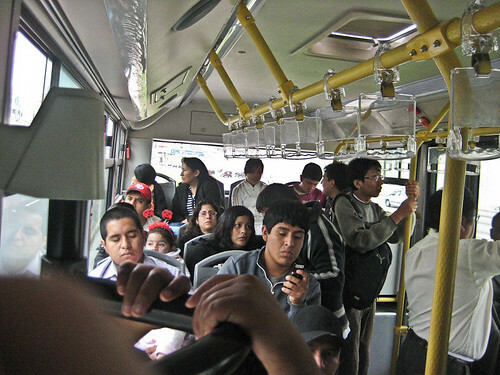 The Metropolitano is a good new system that goes through Lima from North to South. It has dedicated lanes on the roads and is quite efficient and quick. Notice the obligatory youth playing crappy South American pop music on his mobile phone at full volume. When I got back to Barranco, I found a stall in the park selling real espresso coffee, so that was the highlight of the day. 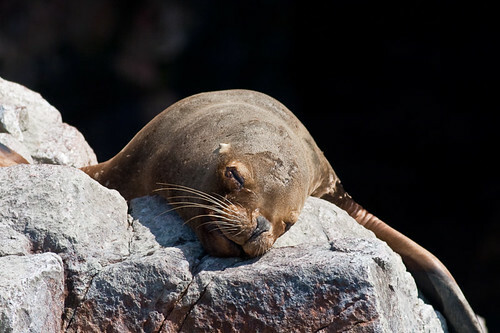 Sunday in Lima, that is it. I finally made it to Lobitos, which is about 70 kilometers south of Mancora. On the way I was quite surprised to see lots of oil rigs pumping away in the desert. there is even one on the beach here. Lobitos is a deserted town inhabited only by surfers and fishermen. Its like surfing on the moon here, it is so desolate and barren. This morning a bunch of Chilean dudes were out at Lobitos point ripping it up. 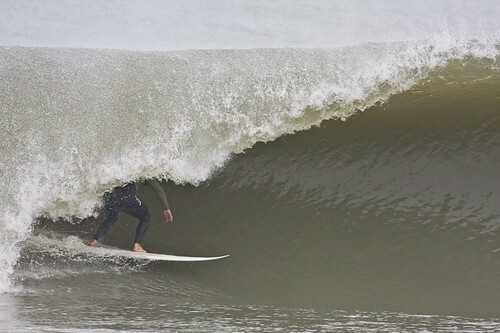 They are used to these conditions, often riding cold, big waves. The inside wave was spitting out barrels like Pipeline. I think it may have been impossible to ride. These guys were surfing the next section along the point. Conditions here are pretty tough. The wind is always blowing really hard, the water is freezing cold, and there are no hot showers. Othere than that, there is great company, surfers from all over the place just hanging out and having fun. Going down to the beach this morning I was quite surprised to see a little camouflaged bird darting around the bushes. 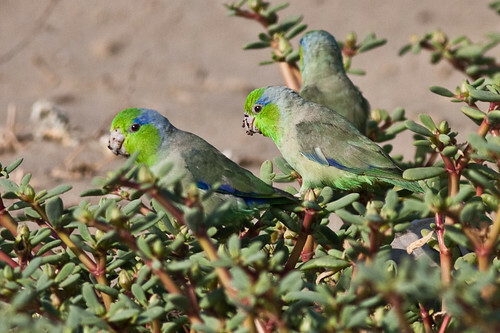 These green parrot type birds were camouflaged very well against the green ground bushes next to the beach. Some had blue flashes on them. While others were all green. Well, yesterday I did not go for a surf but took the camera for a walk to try and photograph some birds. 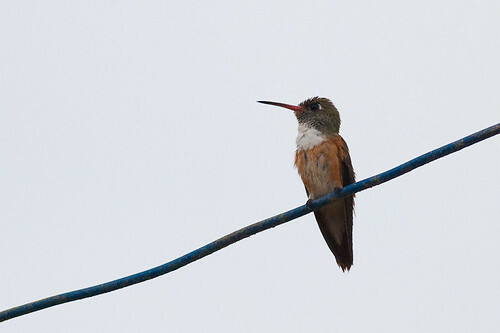 As soon as I got past the end of the hostel wall, I saw this hummingbird on the overhead wire. I had been seeing him for the last few days scooping in and out of the garden feeding on the red flowers. 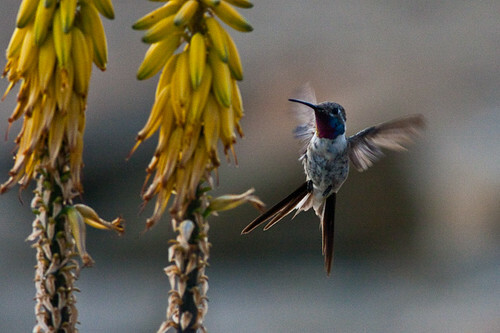 I had a look at the hummingbirds for South America on Arthur Grosset’s web-site, but there were thousands of them. 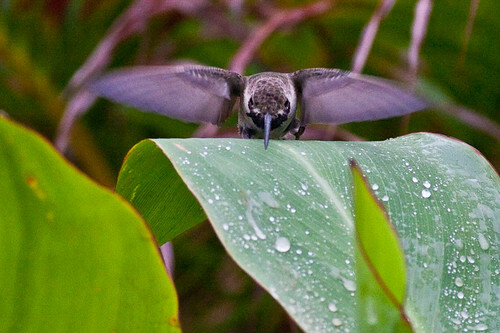 So I am going to wait until I get home before I try and identify any hummingbirds. That one had a mainly orange back and orange in the stomach area. 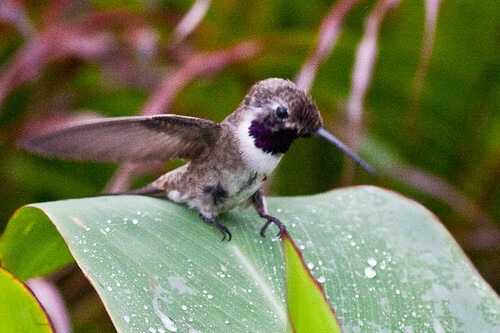 Further down the road at some hotel, they had the water sprays going on the garden and another variety of hummingbird was having a nice bath and slipping around on the wet leaves. This one may have been having a drink or just playing around in the water. I have no idea. It had a purple patch under the chin. 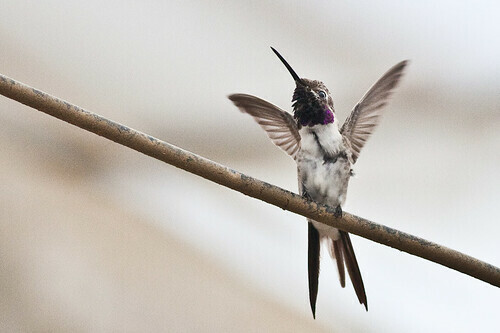 Later on he flew up onto the wire and did some very strange gyrations and flapped his wings around and contorted his body in all strange shapes. This is one of the pretty ones. Later on, down the beach, I spotted this wader that I cannot seem to identify as yet. 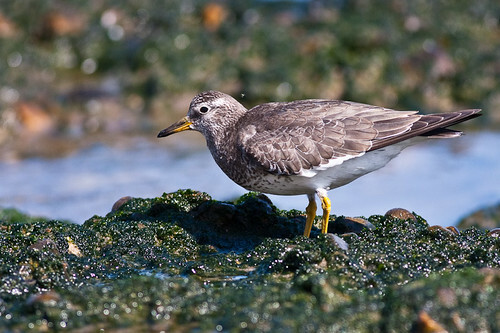 It is not a surfbird, but I cannot seem to place it. 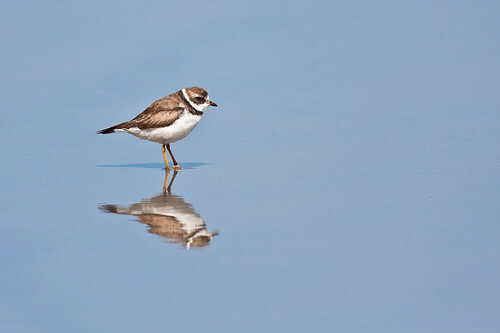 I looked all over – not a sandpiper, etc. I am stumped. 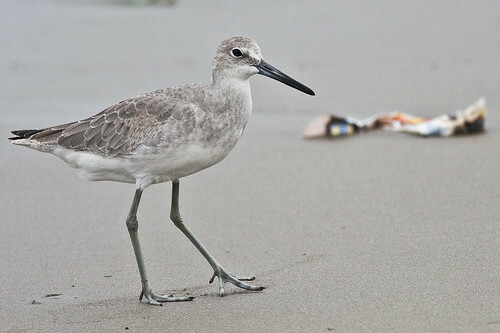 It was a Willet, Tringa semipalmata. 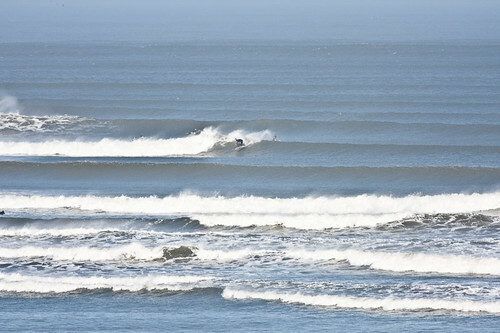 Last night and this morning I have been for a surf and it has been pretty good, but small. This morning I snapped the fin in my board and had to buy another one for 35 Soles. There may be some waves tonight and tomorrow morning. 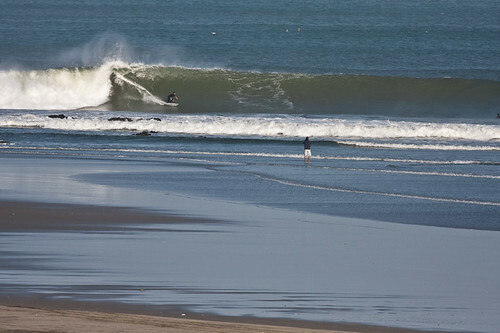 I am waiting for the swell to pick up and the high tides to be in the early mornings. 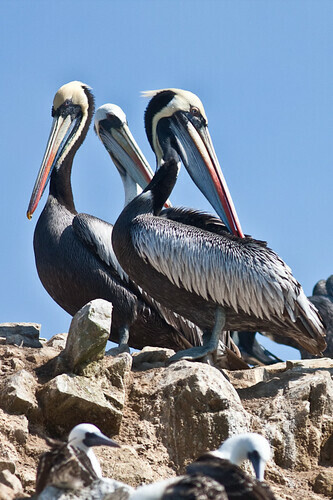 There have been lots of sea birds about, but they are nearly mostly all Peruvian Boobys, Peruvian Pelicans and Magnficent Frigatebirds. 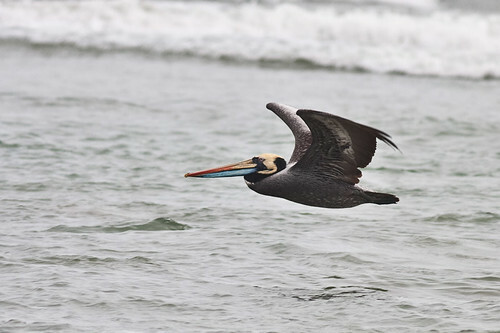 the Peruvian Boobys sometimes fly horizontally into the water to catch fish. They just cruise about above the waves and then whack! dive into the water to catch a fish. There are lots of fish around here. The water is full of them jumping about, so it must be easy for the sea birds to get a feed of fish. 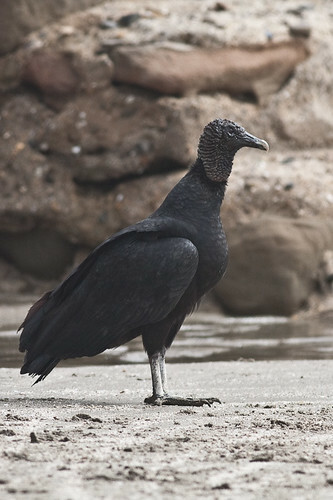 There are both Black Vultures and Turkey Vultures in Mancora, but the Black Vultures seem to stick to the pueblo whilst the Turkey Vultures hang out at the beach. After Chicama, I got the bus from Paijan to Mancora. It left at 8 pm but the seats on Emtrafesa line are horrible. They are really hard and you cannot sleep on them at all. And I landed in Mancora about 4 am and I am surrounded by autotaxi dudes pesterning me. So I settled down and waited for a while and let the tout give me his spiel about the hostels he would get a commission from. I chose the Gaucomayo because it was the cheapest and I was very tired. That day, I went for a surf and it was about 2-3 foot and I enjoyed it heaps. 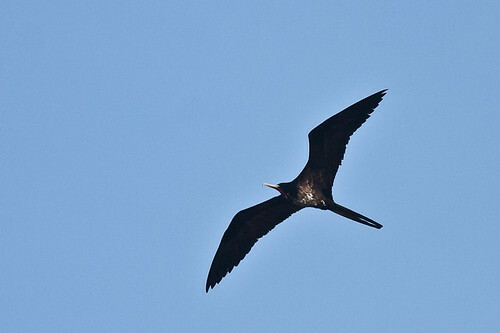 I had been seeing Frigatebirds flying around for a few days, so I finally got some shots in the back yard of the hostel. 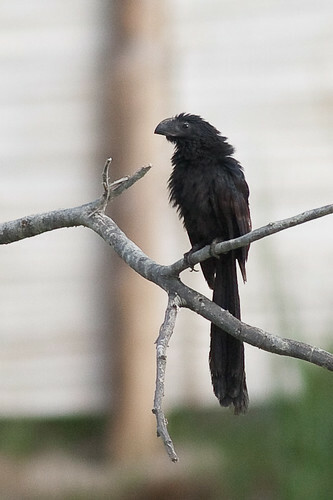 There may be two kinds – one is mostly black and the other has a white belly, or the one with the while belly is a juvenile. I have not done the research yet. Here is a shot with the tail spread a bit. They seem to close the tail up mostly when flying. 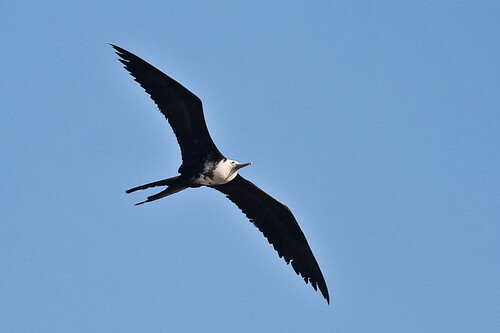 They are Magnificent Frigatebirds, and the male is all black while the female and juveniles have the white belly. There were some waders in the excavation for a pool with a little bit of water in the bottom. One was a Killdeer and the others were Sanderlings, I am pretty sure. If I am wrong, please let me know. 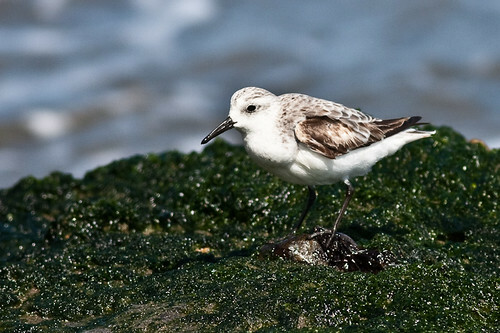 I think it is a wintering juvenile Sanderling. 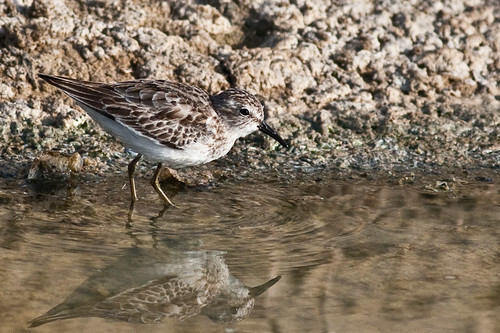 Thanks to JPPerret, it is a Least Sandpiper. 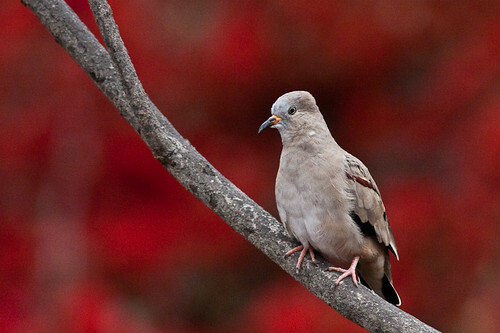 There are lots of Mockingbirds hanging out around the yard. I have not been able to identify them yet. When I get to the internet I will check. 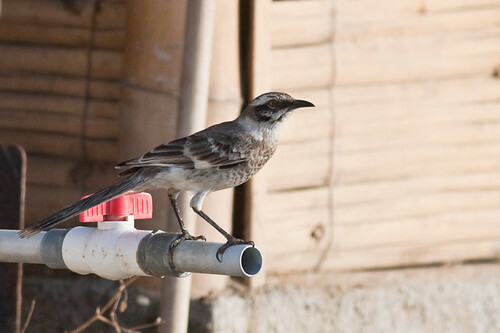 They are of the Family: Mimidae and are called Long-tailed Mockingbird (Mimus longicaudatus). This strange bird with the ugly big beak was hanging around the remnants of what seemed like a sewerage pond in the middle of town. And here is a closer shot of that amazing beak. And I saw one of the varieties of South American Himantopes. They are very similar to the Australian ones. They even stand around in ponds, casting reflections. 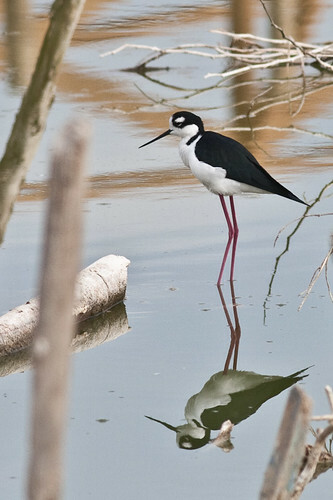 They are in fact the same as the Australian ones – Black-winged Stilt (Himantopus himantopus). Nope, they are the mexican ones. doh! I finally got a shot of these very red birds that I had been seeing in fields as I went past in buses. They could be some kind of flycatcher as they have the whiskers around the bill. I did see one with a bug in its mouth, I think. 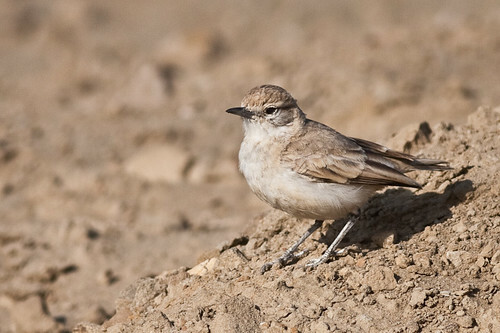 Thanks to Dendroica for the ID. 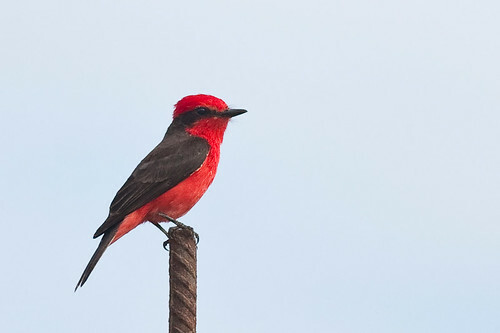 It is a Vermilion Flycatcher, Pyrocephalus rubinus. I was right about the flycatcher part. 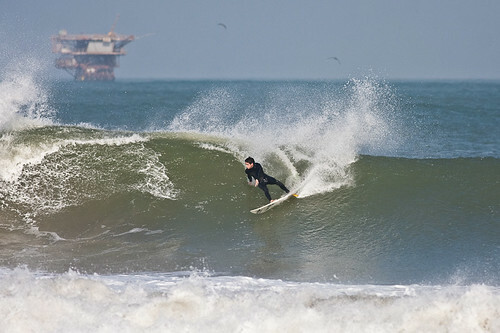 More Surfing and Birds at Chicama, Peru. 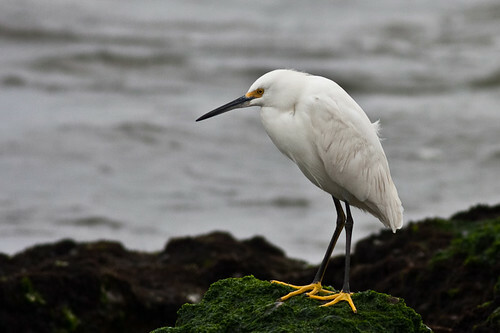 This morning after my surf at Chicama, I saw an Egret down on the rocks below the hostel. 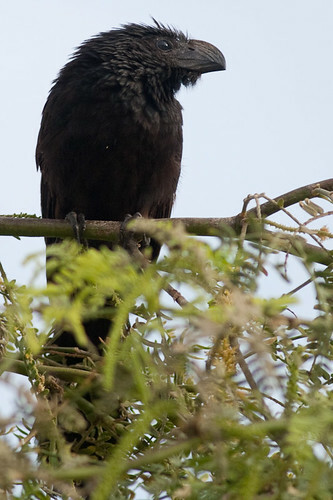 I had seen a couple of them two days ago, and wanted a photo of one. So I grabbed the camera and raced down to the beach. 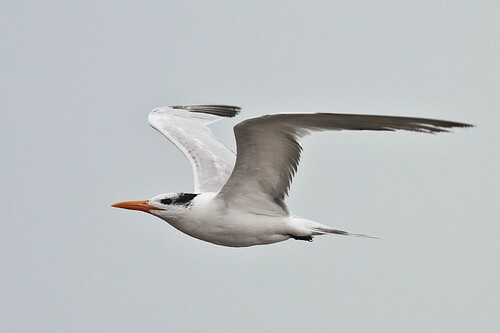 I managed to get some great photos of the Egret, but have not been able to check its identification. I do not have the internet where I am staying so I have to go down to the internet cafe in town. It turned out to be a Snowy Egret. Yellow up the back of the legs indicates an immature bird. 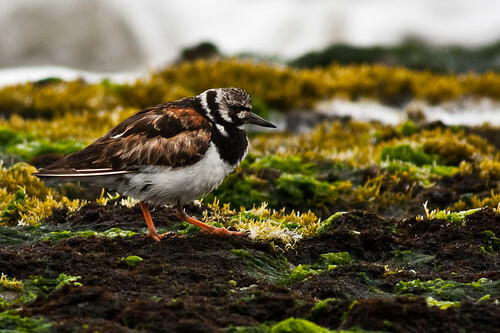 There were quite a few Ruddy Turnstones feeding on the rock shelf as well. 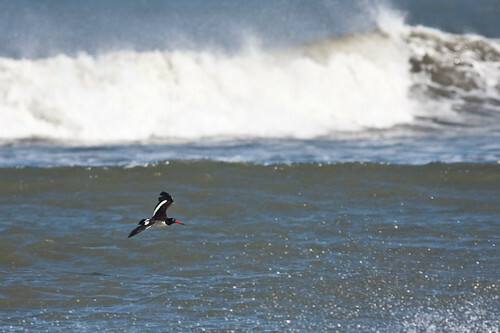 Running up and down with the waves were the Sanderlings and earlier I saw three American Oystercatchers on the beach. 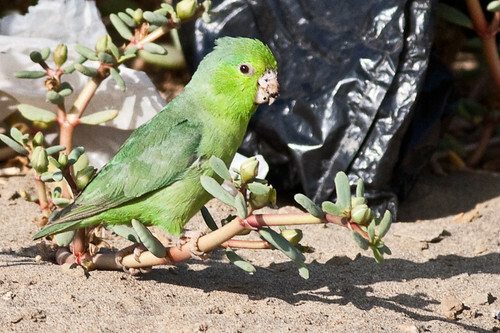 There are quite a lot of birds on the beach and around the rock shelfs. 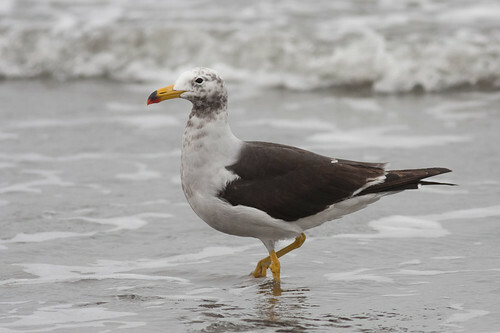 Belcher’s Gulls are quite common around the coast of Peru. 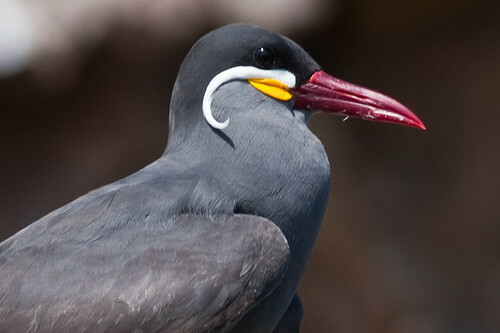 They always remind me of the Pacific Gull. 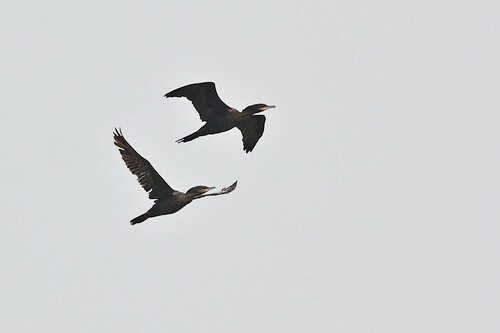 A pair of cormorants flew past and I managed to get a few photos of them. You can see them often fishing in the water around here. 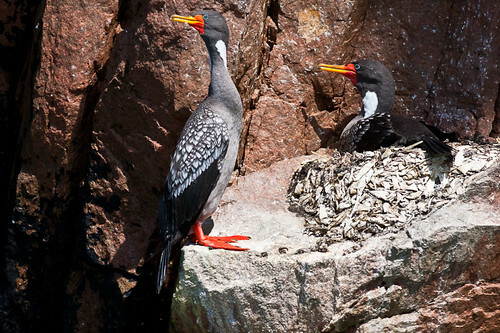 These are Neotropical Cormorants, aka Olivaceous Cormorant, Phalacrocorax olivaceus. 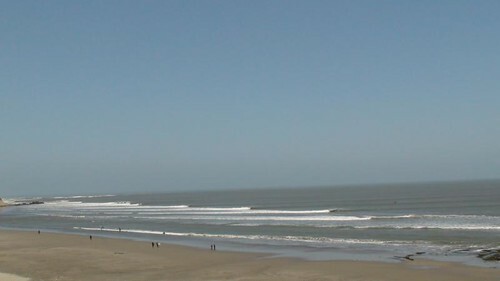 The waves have dropped off a bit here in Chicama. 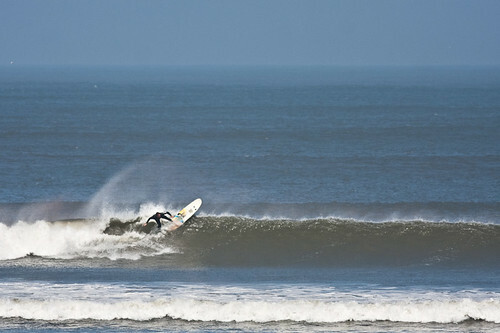 This morning I had a good surf and managed to get some great waves peeling off. Most of the crew have left for Mancora, and there is just me, Dexter, and a French guy, Pierre staying at the El Hombre hostel. Pierre got some good waves this morning. I have been hanging out with some Aussie guys from the Gold Coast and it has been good being able to communicate freely without a language barrier. Well, that is about it for today. I just had lunch of fried fish with rice and lentils and now I am going to have a snooze. It has been a while since I posted my last blog. After Lima, I caught a Linea bus to Trujillo, and arrived late at night at Huanchaco, which is on the coast. The next morning I went out for a ride on my surfboard and it was too small for me. So I went around the surf shops trying to sell it. I eventually found a decent surfboard and decided to rent one for a month. I should have done that in the first place. It would have saved a lot of hassles. My new one is 7’4″ long and 22″ wide, so it floats me real good. After 3 days in Huanchaco, I got a bus to Puerto Malabrigo, more commonly known as Chicama, the longest left hand wave in the world, so they say. There are so many different nationalities here surfing I cannot believe it. There are guys here from Holland, Germany, Israel, Chile, Norway, France, South Africa, USA, Australia, Peru, and Brazil. Everyone gets along so well – surfers around the world understand each other very well. The longboarders seemed to have it the easiest, because the current is so strong and they can get on the waves a lot sooner and get going. 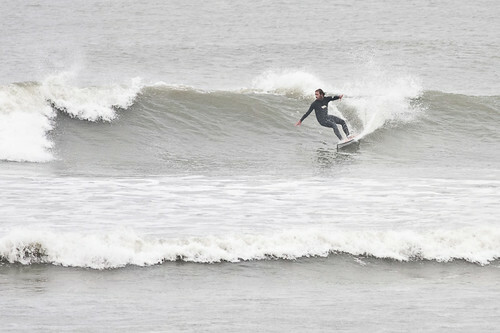 This longboarder was really hitting the lip and coming off cleanly. There was an American Oystercatcher on the beach as well as a Hudsonian Whimbrel. 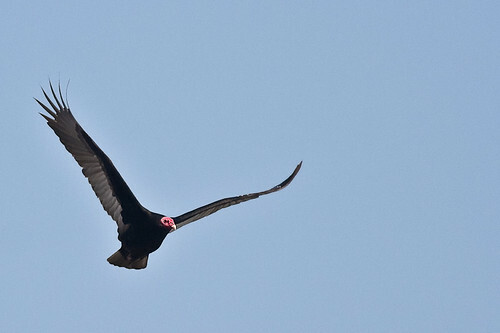 The last couple of days I have seen a Turkey Vulture on the track out the the beach. It has been feeding on a dead Peruvian Booby on the shore. Quite a few Surfbirds were feeding on the rock platforms. The Sanderlings were running in and out of the surf, chasing and being chased by waves that came in. I am not sure what this is Can anyone help identify it, please? I worked out what it is. thanks. 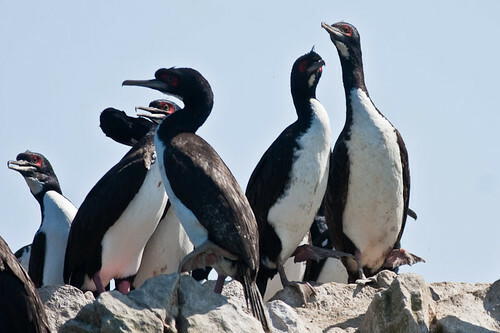 Ater Paracas, I caught the bus to Lima and got a bed in a hostel in Barranco, Lima, which is on the beach. These photos were taken from the roof of the hostel over the two days that I was staying there. I was quite surprised by the number of birds that were around the city. 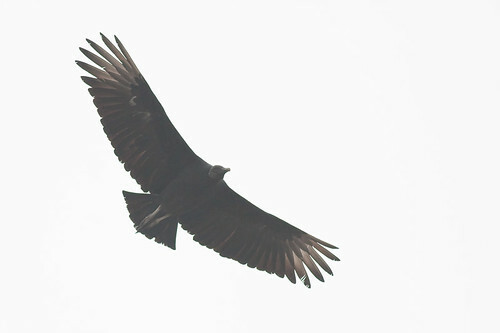 There were lots of Black Vultures flying about overhead in Lima. 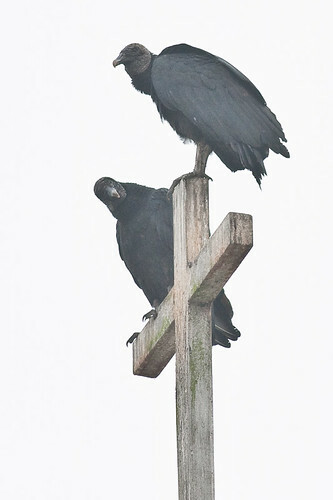 It is quite a daunting experience, especially if you are not used to having vultures wheeling over you. I really like the flaming red background on this photo. There was a plot of land below that was covered in red flowers. 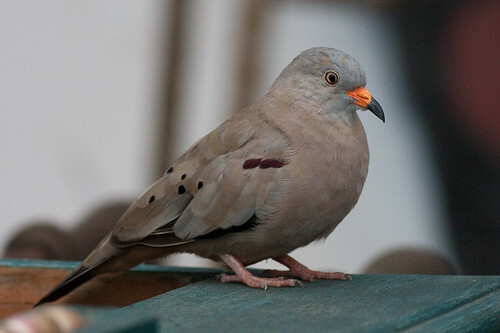 The Croaking Ground-doves were coming onto the roof of the hostel where I was taking the photos. They were really close and allowed me to get this great shot. 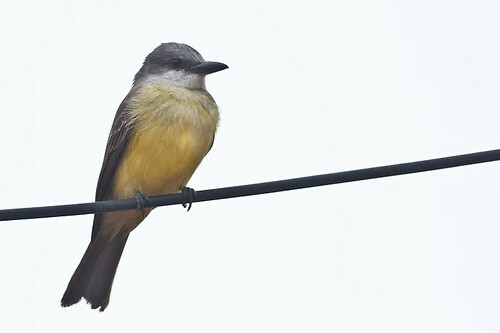 Tropical Kingbird (Tyrannus melancholicus) has a range from Arizona to central Argentina. 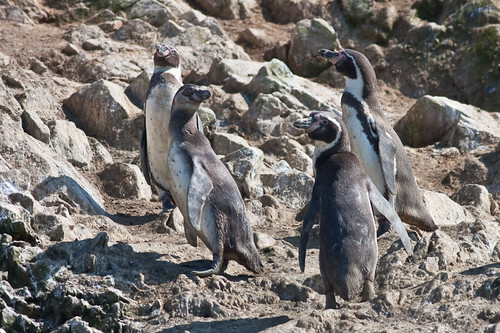 They are widespread, common and adaptable. 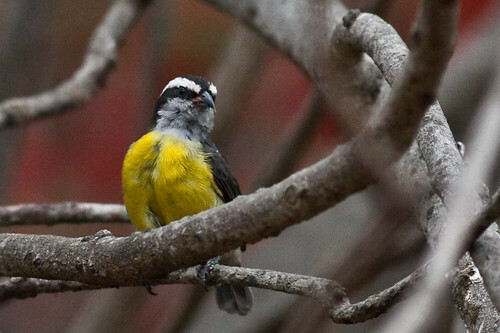 The Bananaquit (Coereba flaveloa pacifica) is a small nectar-eating bird that is found in the warmer parts of the Americas and is fairly common. 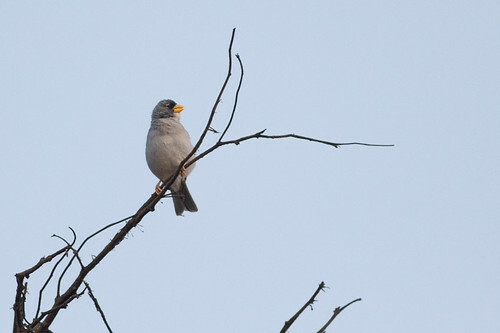 The other birds that I saw were the Rufous-collared Sparrow, House Sparrow and Pacific Dove. After Lima, I caught the all-day bus to Trujillo and arrived in Huanchaco about 11 in the night. Today I went for my first surf in Peru, but my surfboard is too small for me. doh! Tomorrow I am going to try and swap it or rent a bigger board and then head for Chicama. 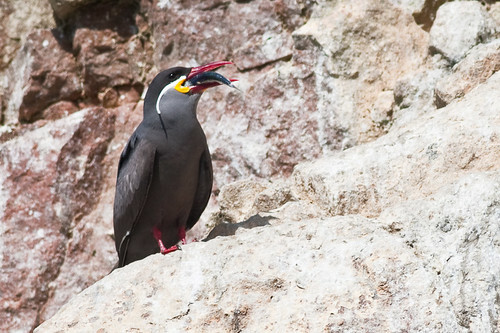 Zarcillo (Larosterna inca) – Inca Tern.